Caption slip reads: "Photographer: Mercurio. Date: 10-02. Reporter: Adler. Assignment: 50th wedding anniversary. 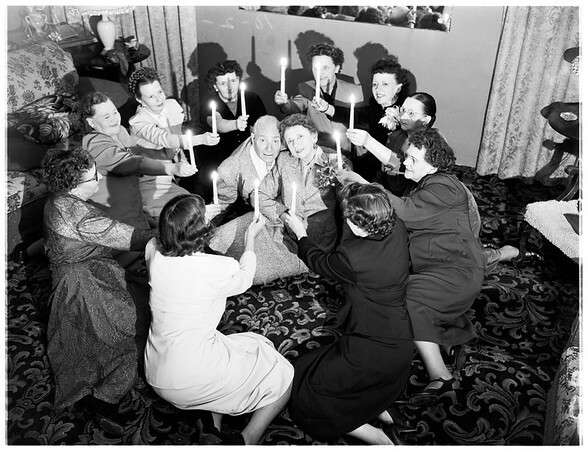 l to r center: Jay G. Fierstine and his wife, Mrs. Lilly Fierstine, celebrating anniversary --- in circle around them are 10 of her sisters -- (starting with lower left, clockwise:) Mrs. Harriette Kirby, 43, Mrs. Selma Anderberg, 54, Mrs June Treloar, 52, Mrs. Gladys Edwards, 50, Mrs. Hazel Loughlin, 46, Mrs. Verlie Tyler, 48, Mrs. Vinola Surber, 45, Mrs. Clara Carsrud, 65, Mrs. Lottie Drake, 67, and Mrs. irginia Friel, 41 --- all making out like wedding cake".